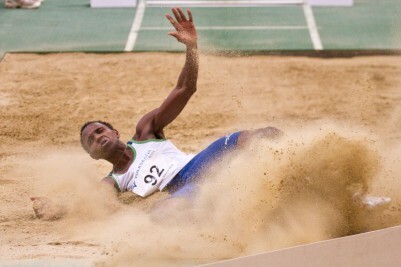 Some athletes and coaches view the long jump as simply an event that involves running and jumping. Yes, that is the fundamental premise of this event, but I can assure you there is a bit more to it than just that. You might find it interesting to know that to be a successful long jumper you do not have to be amazingly fast. Speed is just one element to successful long jumping. For sure, the more speed you have, potentially the better, but there are many other factors that play their role when athletes perform the long jump. Your head position and where you focus your gaze during the approach to the takeoff is important to good long jumping. Resent research has identified what elite jumpers do with their gaze as they approach the takeoff point and so we are able to learn and implement their findings. The best jumpers seem to use two types of strategies on the approach run into the takeoff. The first part of the run up is completed using a programmed rhythm- one that the jumper has rehearsed repeatedly. As they get nearer to the takeoff point (about six strides out), they switch to what is called a steering mechanism. This is where the eyes of the long jumper takes over and try to guide them accurately onto the takeoff board. It is important that during this steering phase that you do not focus on the board but try to take in the information peripherally. For all intent and purpose, you need to be look directly ahead. This way you will have a sense of the board location relative to your speed, but you should avoid looking down at the board while trying to jump up. Trying to find the takeoff board will cause you to decelerate and as we have already established, takeoff speed is very important to the successful long jumping. The efficiency of the landing can gain or loss you 5-8 inches. The idea is to get your heels to enter the sandpit as far ahead of you as possible. The landing process should start near the crest of the flight path. At this point you should place your feet horizontally well ahead of the body’s center of mass (CM). This is made easier by moving your trunk closer to your thigh and your head should be in a straight line with your spine and your arms should be below the out stretched legs. As your legs enter the sandpit they should be almost straight. At this point your trunk should move to a more upright position and as this happens you should give or flex at the knee to allow the body to past over the point at which the feet entered sand. Get ready to launch yourself, because arguably the most important feature of the long jump is the takeoff. There is a real skill in making the long jump takeoff efficient and effective. The preparation for the takeoff is achieved by lowering the center of mass of your body during the penultimate step. By doing this it sets you up to apply as much force as possible to the ground in that final step to launch yourself into the air. What exactly is the right training for long jump? The simple answer to this is anything that makes you fierce, furious, and fast. Your workout should include the 5 elements of fitness which is speed, strength, skill, stamina and flexibility. The three most important ones are the development of strength, speed and technique. Without doubt, the more completely fit you are the better long jumper you will be. To improve your speed for the long jump, you need core strength. So weight or circuit training would be good for you. Making the right choice in jumping shoes can protect you from injury while heping to jump further. From "Secrets to a Successful Long Jump" Back To "Faster, Stronger, Better – Your Shortcut To Improved Athletic Performance"